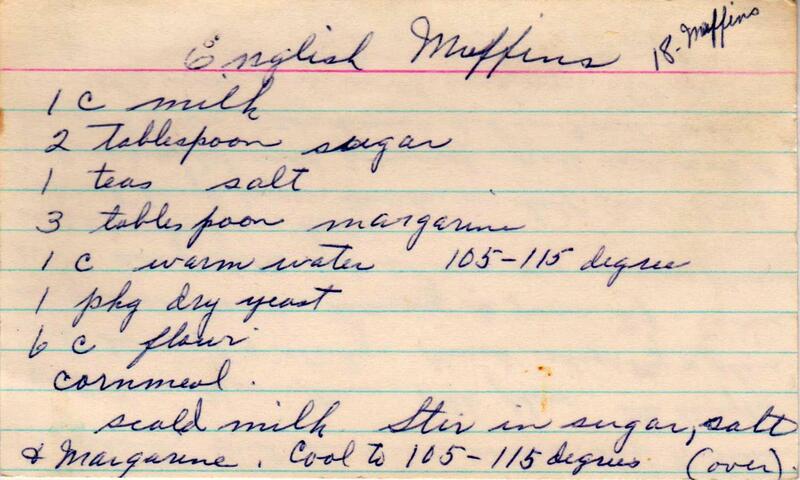 This vintage recipe for English muffins, from a collection of a 1940s Wisconsin housewife, was quite successful. 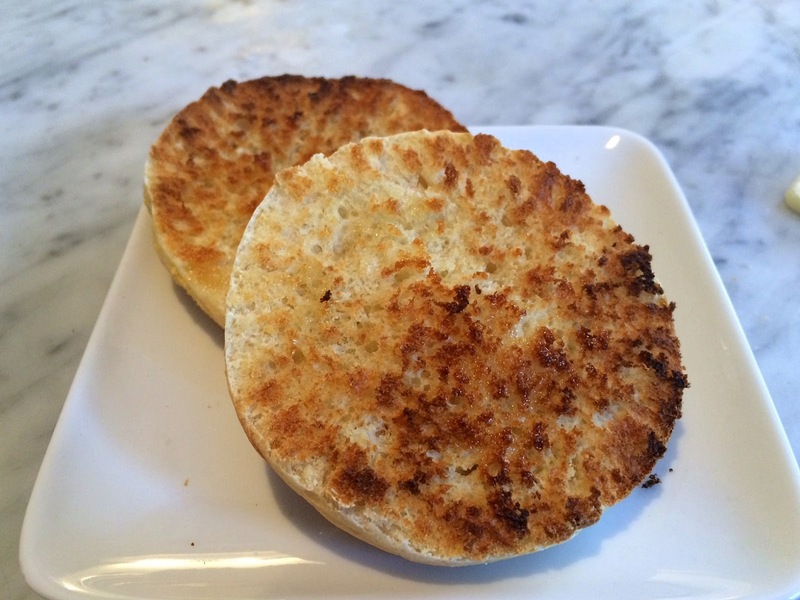 Homemade English muffins are very easy to make and way better than the store bought variety. 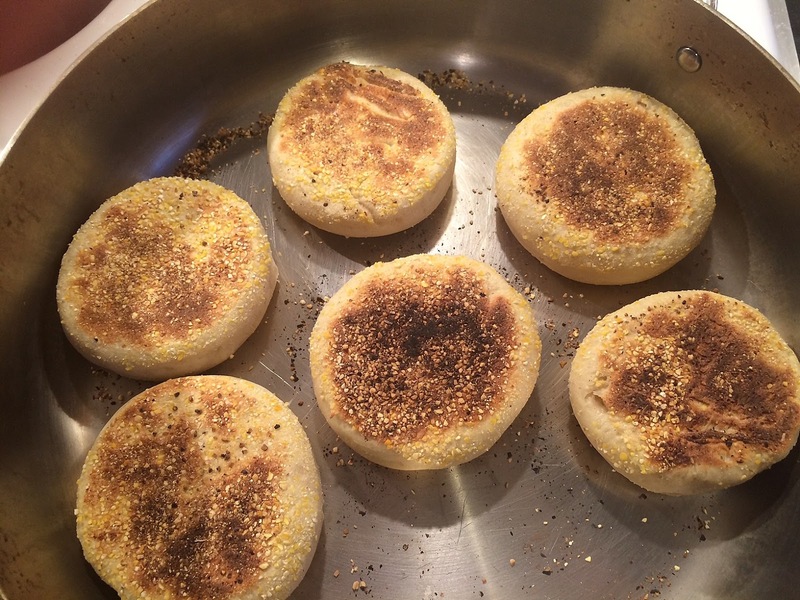 You don't even need an oven -- these are "baked" in a skillet on the stove top! 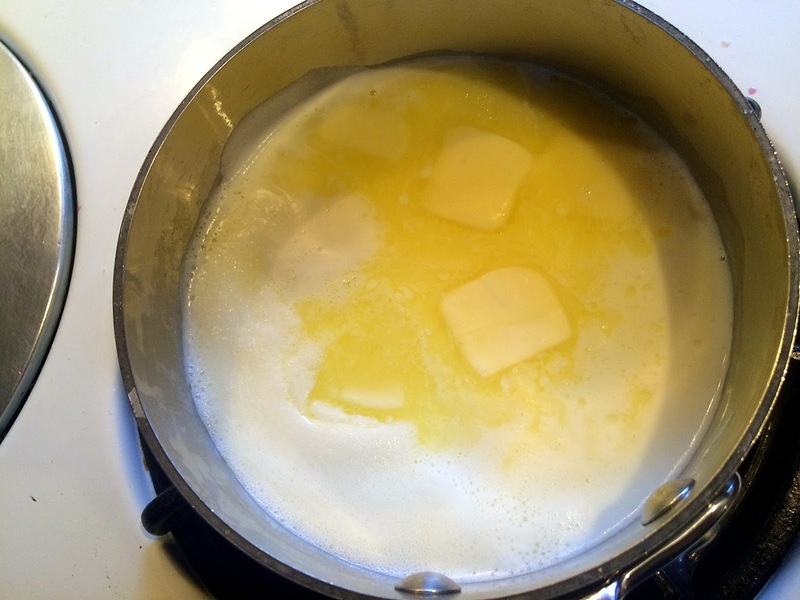 To begin, scald milk and add butter, salt and sugar. Let the mixture cool a bit. Proof yeast in a bowl. (Just mix it with warm water.) 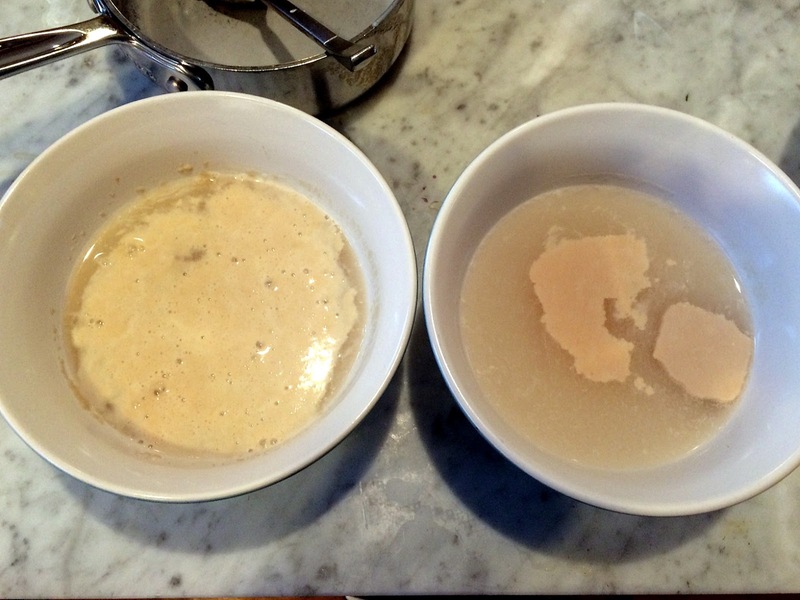 The yeast on the right (although it hadn't expired) was clearly dead. So I tossed it and tried some rapid rise yeast, which was expired (and is also supposed to be added dry to the flour) and it worked beautifully -- note the bubbles. This is one reason I love working with yeast; it is sooo forgiving. 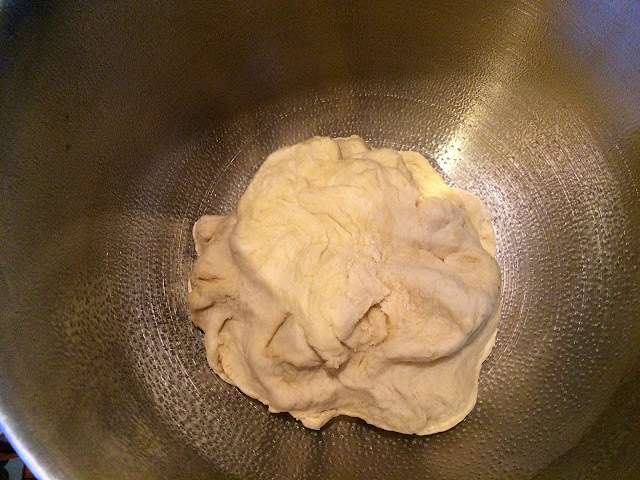 Mix the dough and knead a bit. I cheated and used my Kitchen Aid (with the dough hook). Cover and let rise until double. Punch the dough down, and divide in half. 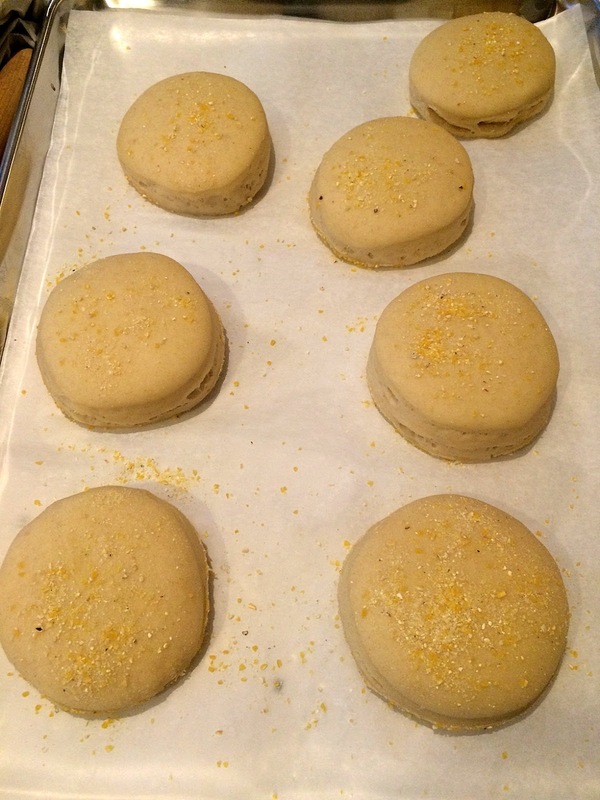 Roll half out on a board or counter sprinkled with cornmeal. 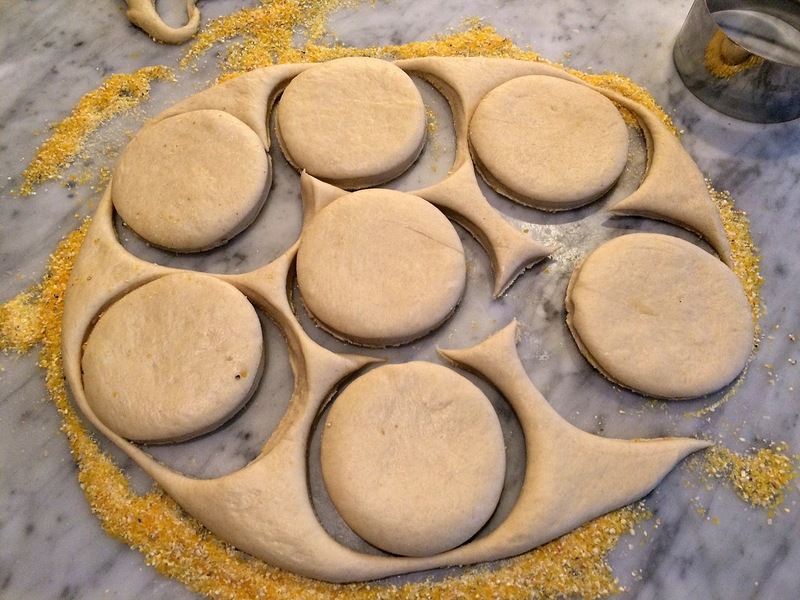 Cut out circles with a three-inch biscuit cutter (or a glass, or whatever you have around). 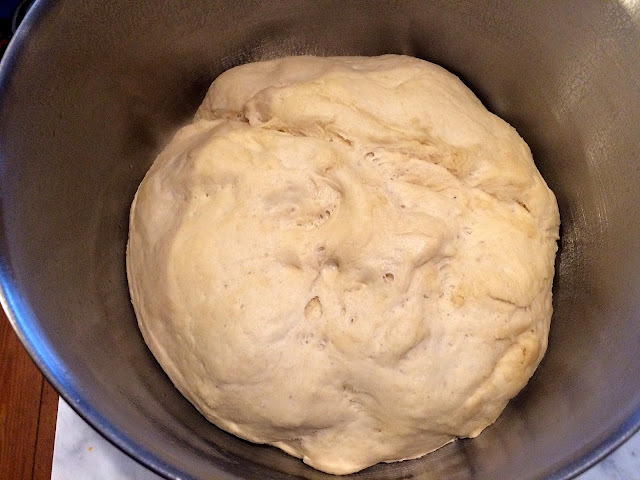 This dough is extraordinarily easy to work with. Place the muffins on a tray and cover. Until double in size (about an hour, or two episodes of Mozart in the Jungle). 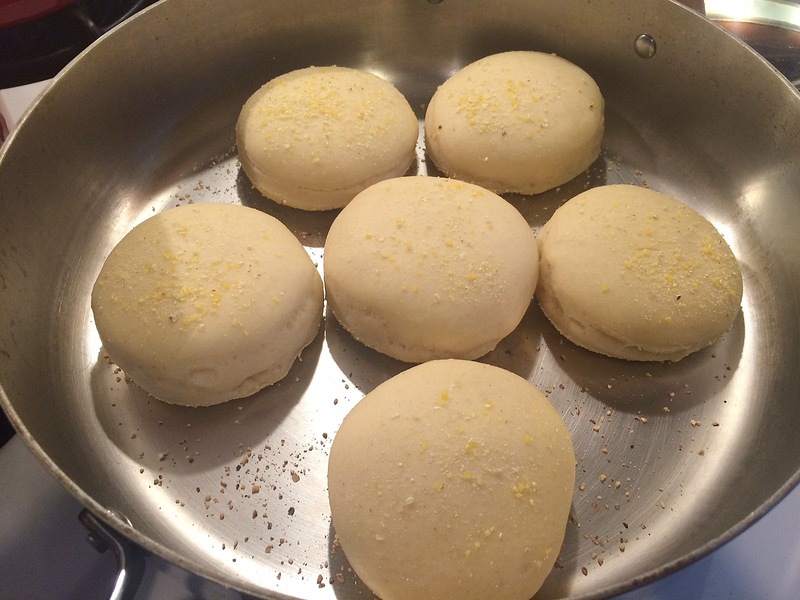 Place in a medium hot skillet. Cover and cook about five minutes. Flip and cook the other side about five minutes. They don't stick at all, even if you don't use a non-stick pan, like I did. Here's the original recipe card, and below that is a typed, easy-to-read version. 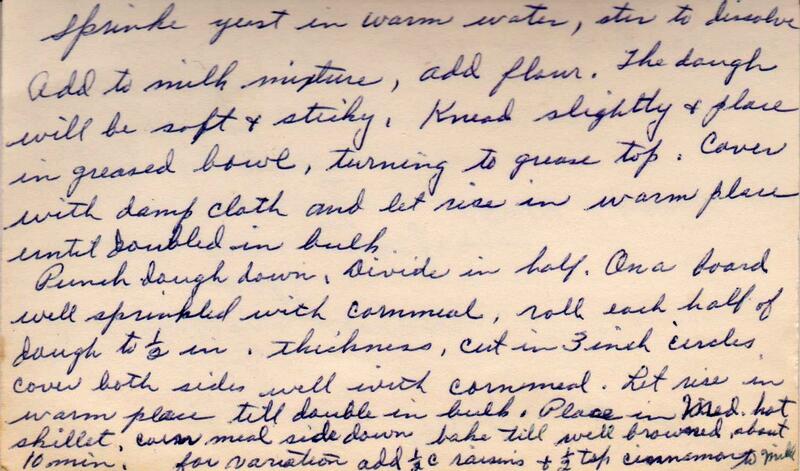 Production notes: The original recipe said that it makes 18, but I got just 13 from the dough. There were scraps to make more, but I didn't see how to combine them and roll them with incorporating all the cornmeal. I didn't use a thermometer at all. 105 - 115 is warm-to-the-touch. If in doubt with the yeast, go colder -- too hot and it will die. I used butter instead of margerine, but otherwise followed this exactly. Getting the right stove top temperature is critical, otherwise the muffins will be cooked on the outside and gummy inside. I did a few at first to experiment, cutting them open. If they are too gummy at the end, you can always pop them in the oven for a few minutes. Scald milk (bubbles will form around the edge of the pan). Stir in sugar, salt and butter. Sprinkle yeast in warm water, stir to dissolve. Combine yeast mixture and milk mixture in a large bowl. Add flour and mix. Knead slightly (or more, if using a mechanical kneader). Cover with a damp cloth and let rise in a warm place until doubled in bulk. Punch dough down, and divide in half. 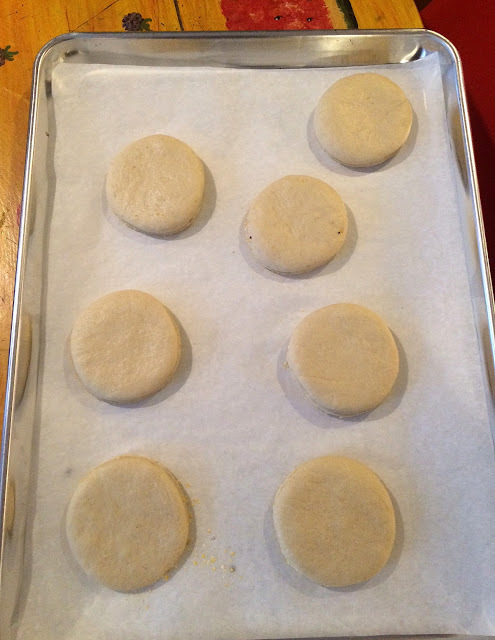 On a board sprinkled with cornmeal, roll each half of dough to 1/2 inch thick. Cut in three inch circles. Cover both sides well with cornmeal. Variation: Add 1/2 cup raisins and 1/2 tsp. cinnamon to milk. Thanks, witloof. I was happy they looked just like English muffins, myself! 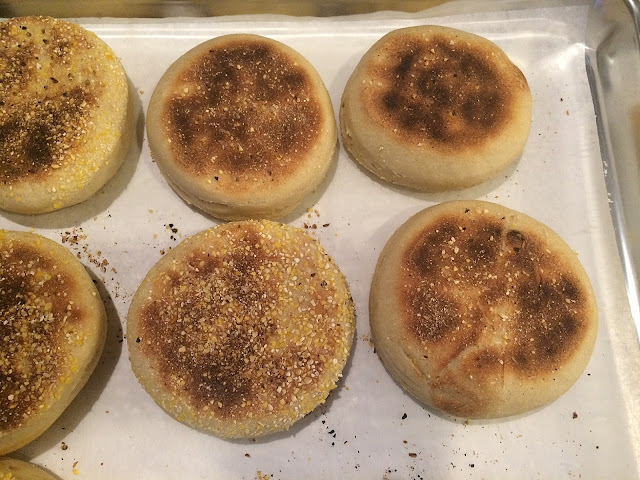 I made these today and instead of rolling them out on the cornmeal I rolled them out on a cutting board and then put them in a dish of conmeal.I was able to use all of the dough and made about 20. Fabulous idea, Angela!! Thank you! Just made these...They are amazing! 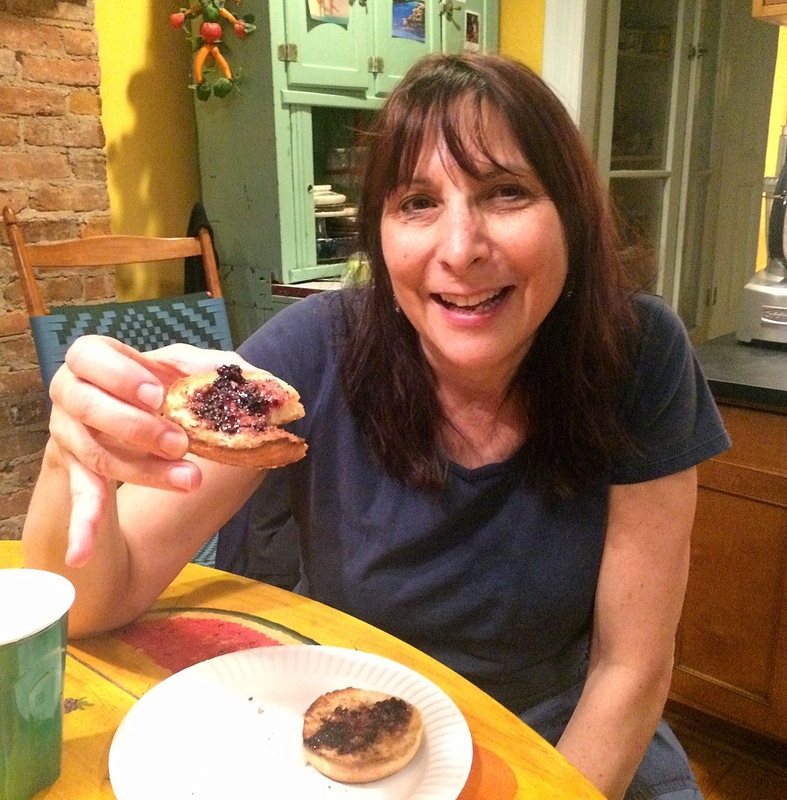 I'm not sure I'll ever buy English muffins again! I got 18; did the trick above (rolling in flour, dunking in cornmeal). For the cost of a little flour, butter and milk these are not only delicious, but such a money saver! I'll bet they freeze well too! Thanks for the outstanding recipe! You're welcome! I have some in the freezer, but haven't toasted them yet. I'm sure they'll be delicious.